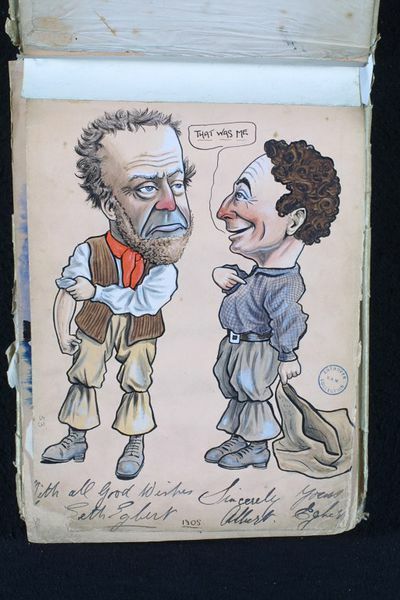 This caricature is of the double act that The Egbert Brothers performed at the Grand Theatre of Varieties, Hanley, during the week of the 6 November 1905. The act was billed as 'The Celebrated Brothers Egbert. The King's Comedians'. This is one of the many superb caricatures of Edwardian music hall performers that were drawn by the artist George Cooke and compiled in a series of albums. Seth and Albert Egbert were famous for their comedy routine 'The Happy Dustmen', which featured some tumbling, as well as their catchphrase 'Hurry up, Walter'. They performed it in pantomime and music hall, taking it to halls around the country, as in June 1906 when they were in Sheffield, Bradford, Leeds and Hull. They appeared with Lupino Lane in Billy Merson's early films, made before 1914. At Christmas 1916 they were in Cinderella at the London Opera House with Fred Emney as the baroness, performing a slapstick 'whitewashing scene'. This caricature is of the double-act The Egbert Brothers - Seth and Albert, who appeared at The Grand Theatre of Varieties, Hanley during the week commencing 6th November 1905, billed as 'The Celebrated Brothers Egbert. The King's Comedians.' They specialised in comedy routines including 'The Happy Dustmen' which they performed in music halls and pantomime. It has been glued into the album which explains why it is out of chronological aorder in the album. In June 1906 The Egbert Brothers were on the bills of the Tivoli and Camberwell on the same evening, and advertised two other items - 'The Unemployed Question' and 'The Wrong-un's Bedroom', described as 'song-scena' This comes from the second album of caricatures in a collection of albums owned by the Theatre Museum compiled by the graphic artist George Cooke. It is labelled by the artist 'Geo Cooke HYS BOOKE' and features music hall performers working in the early 20th century. 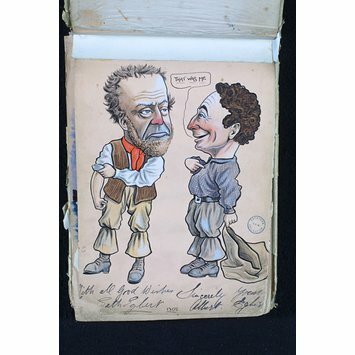 Caricature of the music hall performers The Egbert Brothers, from an album of caricatures drawn by George Cooke. Dated 1905. The Performer, 21 June 1906, advertisement of engagement.